No. Wellbutrin is not a narcotic drug by medical or legal definition. In fact, Wellbutrin is not a controlled substance at all. More about Wellbutrin, including its uses and side effects, here. No. Wellbutrin (bupropion hydrochloride) is not considered a narcotic in any medical or legal sense. While Wellbutrin can have negative side effects, most people do not get high on Wellbutrin and is not addictive. There are anecdotal reports of people attempting to abuse it, but this mostly causes seizures rather than a euphoric high. We’ll look more at Wellbutrin, its uses, and legal classification, here. We invite your questions about Wellbutrin at the end. Medical narcotics are drugs which provide pain relief. Typically, “narcotics” drugs are opiate medications, which cause sedative effects and slow brain activity. Different narcotics treat varying levels of pain, from moderate to severe, and also other troubling symptoms like cough or diarrhea. Narcotics can cause drowsiness and even loss of consciousness. They can suppress breathing and heart rate, which is sometimes fatal. Wellbutrin acts differently on the body and is not part of this family of drugs. The term “legal narcotic” is used to refer to any illicit drug. Legal narcotics include opiate medications and drugs regulated by the Controlled Susbstances Act, like marijuana and cocaine. Wellbutrin is not classified as a legal narcotic because it is not widely abused and is not considered to be of particular risk of addiction. Therefore, Valium is not a legal narcotic or controlled substance. There have been a handful of recorded cases where people have crushed and snorted Wellbutrin in an attempt to get high. They ended up in the emergency room, presenting with seizures and other side effects of Wellbutrin overdose. While some of theses people have reported a “high” resembling the use of cocaine, doctors don’t consider euphoria to be an effect of Wellbutrin use and say that any Wellbutrin high is unlikely. Why isn’t Wellbutrin on the controlled substance schedules? There just isn’t a widespread problem with Wellbutrin abuse that would justify making it a controlled substance. Wellbutrin should not be taken without a doctor’s prescription, but doesn’t have the abuse potential which would make it truly dangerous. Will Wellbutrin show up on a drug test for illicit drugs? Not, because it is not included in standard 5 panel drug screens. 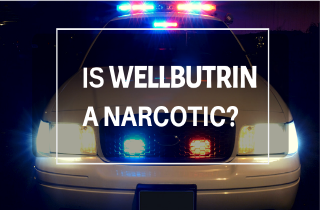 Wellbutrin won’t cause the drug-seeking behavior or craving characteristics of addiction. However, users will develop a physical dependence if they use Wellbutrin long-term. To stop taking Wellbutrin, consult with your doctor. You need to be weaned off the medication slowly, to avoid unpleasant withdrawal effects, which can be serious, including seizure. Unless larger numbers of people begin presenting with the symptoms of Wellbutrin abuse, there’s really no need to change the DEA classification and schedule for Wellbutrin. For most people, abusing this drug will have no benefit, so it’s not useful to criminalize it the way that opiates and cocaine are criminalized. But what do you think? Please leave us your opinions, comments and feedback below. Do you still have questions about Wellbutrin as a narcotic? Please leave us your questions and comments here. We try to respond to all legitimate queries personally and promptly. I know a person who is on Parole. They take drug tests once a month. My friend has been very depressed and suggested to take wellbuitin. They have 150mg that was prescribed previous, not now. They want to start taking it again. Will it show up on their urine test? Hi Shifra. No, Wellbutrin does not show up on a standard urine screen drug test. But Wellbutrin can be detected using blood tests. It will show up on a blood toxicology screen specifically ordered for Wellbutrin. Buproprion is a very addictive and it even after a few minutes tastes like the very clean remnants of either and compounds the use to make it. this drug is very potent especially the 150 mg they hit more at one and it numbs and in a few minutes has the taste of cocaine that not so cut or dirty but its barely got a hind of synthetic taste to it. much more pure and very addictive I wanna do them more often then vyvance or Adderall that are dextroamphetamine isomers. wellbutrin causes the energetic but fuzzy relaxing feeling with it and if we all can remember cocaine is half stimulant and hallucinogen. Buproprion does exactly the same its more harsh as its more pure and also synthetic but so is phentynal and its more potent then all. very addicting to snort. My Dr started me on this week. I was on Cymbalta for nerve pain but I started getting suicidal on the drug so my doctor switched it to Wellbutrin medicine. I’ve been on it for 24 hours and I’ve read some interesting information on it in the past I have taken Phentermine as prescribed by my position. So I do have some insight on stimulant effects. So far I have not had any amphetamine like effects with this medication. I will update in a week or so. By the way my doctor started my therapy at 150 milligrams twice a day. Hi Tammie. I suggest that you consult with your doctor before taking anything. Wellbutrin is widely abused here in Northern Vermont via IV injection. I have seen some horriific abcesses and un-healing tissue from injection of wellbutrin here where I live. I understand from reading that Canada , not far from here, has had a similar problem. I have been crushing and snorting my 150 and 300 XL bupropion tablets for about a month. I can’t stop. If it’s not addictive, why do I get high? I find myself rushing home, very addictive behavior, I know, to use it. I used many other drugs over the years and I am in long term recovery now, probably 12 years. So I know the drill. It’s a terrible thing anyway. It causes stuffy-noses like crazy. The high only lasts for a short while, and I have to do more, so I’ve gone through many pills very quickly. And I have used my spouse’s as well. I’m basically screwed. I can’t keep doing this and I have to tell my spouse now. Please advise. Hello Jessica. I’d suggest that you speak with your prescribing doctor or a pharmacist about this question; you’ll need exert advice to make a decision and to inform yourself about possible risks and contraindications. I recently very recenly (2 days ago) began taking Wellbutrin. Years ago I took zoloft for a couple month, and while on zoloft I felt no effects from standard anti-anxiety meds (was using ativan). I’d also use ambien to get to sleep sometimes but it never seemed to work on zoloft. I would have to take much more ativan than I ordinarily did to experience the same level of anxiety reduction. I don’t take either ambien or ativan very often, but I want to know if I’ll have a problem when I do. Is there any reason to believe Wellbutrin will interfere with benzodiazepines or ambien? Hello Kathy. Wellbutrin can help address dysphoria (intense dissatisfaction with life, or the inability to feel pleasure) that is caused by long term use of meth. Anti-depressants can be a great aid to people in recovery, but each addict is treated on a case-by-case basis. So timelines vary. Does this answer your question? should a meth addict in recovery (off meth and in a 12 step program) take wellbutrin? I have read that Wellbutrin, even though it is prescribed for depression with anxiety, might cause\worsen anxiety in some people. does the academia have an explanation, even a theoretical one on how such a paradox is possible? Hello ri mceoin. Because bupropion is extensively metabolized, there is the potential for drug-drug interactions, particularly with those agents that are metabolized by or which inhibit/induce the cytochrome P450IIB6 (CYP2B6) isoenzyme, such as ritonavir. It’s also recommended that you avoid alcohol and St. John’s Wort while on Wellbutrin. Additionally, although the mechanism of action of bupropion is unknown, it seems to potentiate central nervous system activity of both norepinephrine and dopamine. It is a weak inhibitor of both dopamine and norepinephrine reuptake, but it may potentiate the activity of these two neurotransmitters through other, more complex, mechanisms. To answer your question, it seems best to consult with either a medical doctor or a pharmacist. These professionals can advise you more at length about the way that bupropion interacts with drugs which affect the opioid receptors in the brain and central nervous system. do wellbutrin and/or citalopram ever have a potentiating effect in narcotic drugs? Hi Karen. Thanks for your question. As far as I know, bupropion is not a controlled substance by the Controlled Substances Act. Can you ask your doctor’s office to clarify. It is possible that people have been using or selling buprorion for non-medically supervised reasons such as opiate withdrawal, so it has been regulated for a reason. Ask again and see what your doctor’s office has to say. I take Wellbutrin for Depression. I’ve been told by my medical provider that “due to ‘Obamacare'”, Wellbutrin is “now a controlled substance” and that I therefore have to go to their office to renew my prescription every 30 days. In the past I’ve had a scrip standing for 6 mos or so. I’ve been told that these changes took effect in the last few months. What gives? Do you have any further information about this? How much Wellbutrin is too much? Can you overdose (OD) on Wellbutrin? How long does Wellbutrin withdrawal last?